Cole Mill Road is a lengthy road in the northernmost section of Durham that branches off to numerous neighborhoods of various affluence levels. Neighborhoods along the road share the commonalities of a heavily wooded environment and expansive land space. However, there are some other aspects which highlight stark differences between neighborhoods. Stoneybrook for example (more on this subdivision in the next paragraph) is probably the nicest neighborhood I’ve seen in Durham. The neighborhood itself is flanked by a large golf course that looked surprisingly empty. It seemed more like a private golf course for Stoneybrook residents than anything else. On the other hand, the subdivision off of Jefferson Dr. has the look of a loose settlement in the mountains. The hilly area is dotted with wood cabin type establishments, but the houses virtually have no lawn as they are smothered by the dense forest. The houses also look worn and there are large amounts of trash lying around. Stoneybrook Drive is a small road off Cole Mill Road which leads to very nice looking neighborhood. 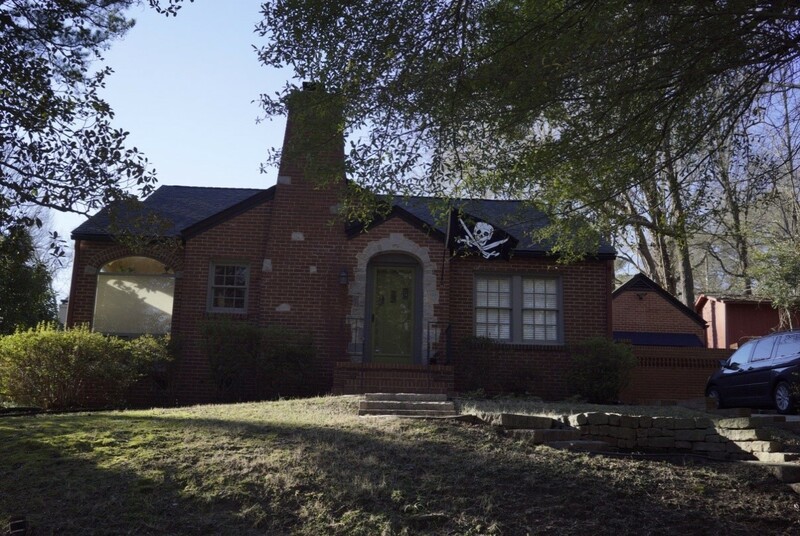 Having first observed the neighborhood on Jefferson Dr. off of Cole Mill Rd., I was not expecting to see anything too enticing in terms of housing. However, as we drive in to check out the real estate, the first thing we see is a flashy new BMW coming out of a driveway. The status of the car certainly did not outdo the status of the household from which it came. The uniquely constructed brick house was gated, had elaborate landscaping, and also spanned upon a rather large piece of land. The backyard was spacious and led right into the golf course. Further down the drive was a sign warning of a neighborhood security watch that would report any suspicious activity. This was one of two neighborhoods that I saw this sign. (The other is East Forest Hills Blvd. )There was another house that had two BMW’s in the driveway. The house that stood out the most is pictured below. Its appearance did not fit in with its surrounding at all. The house had modern architecture with a wild-west style. Pine trees and a western designed mailbox surrounded by cacti distinguished its landscaping. What stood out about this neighborhood was that every house seemed to have been uniquely designed by the owner as opposed to a cookie-cutter neighborhood. This aspect speaks to the upper class nature of the neighborhood as well as the relatively recent construction of the houses. A modern, stylish house of the sort usually seen in southern California rather than in North Carolina. Guess Road led the tour back into a commercial area nearer the central part of Durham. Guess Road is primarily lined with cheaper food, retail, and service options. I noticed that the street also exhibited greater diversity in commercial options than most other streets I’ve driven around in Durham. For example, almost half of the stores have Spanish in their names. There is also a Chinese dim sum restaurant (this kind of Chinese food is rare) nestled between a hot dog shack and a BBQ joint. The condition and aesthetic of the buildings/plazas matches the economic state of the area. The buildings appear old and worn, and while the road itself sees relatively busy traffic, the parking lots along the road are often barren. Northgate Mall is old and a bit rundown, and it shows. A large Sears (a true mark of any ancient mall) towers in the forefront of the strip mall. The parking lot, on a sunny Saturday afternoon, is hardly a third filled. Both the exterior and interior of the mall clearly aren’t the most inviting commercial setups, and I feel that most people come to this mall for necessities rather than retail therapy. Inside the mall is a grand carousel that must have been a major highlight back when Northgate was built, but now it seems out of place. I noticed that many of the stores are either low end brands or small cheap shops set up by independent vendors. As the number of cars in the parking lot suggested, the traffic within the mall was eerily low. Also, some members of my group were walking around with fancy cameras, and we got stopped by mall police warning us that taking any photos of the mall property is strictly prohibited. 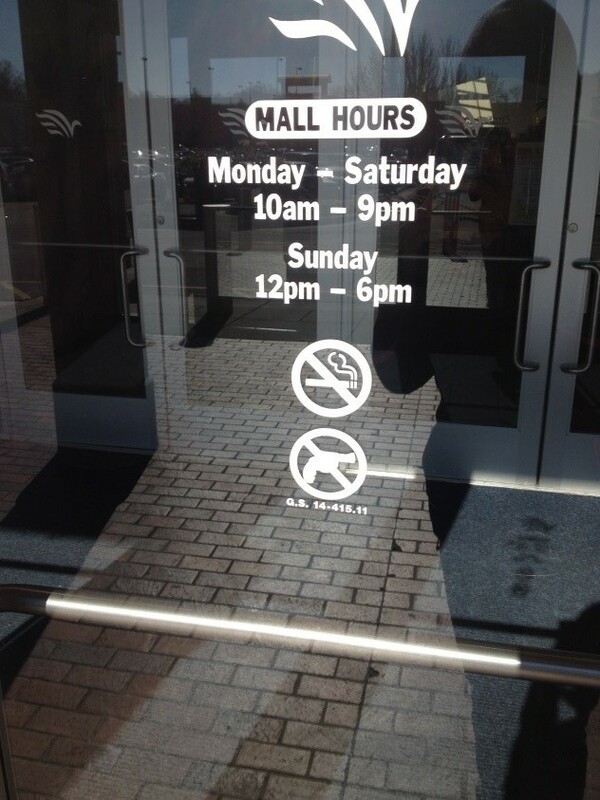 I’ve read that Northgate Mall has received publicity for the wrong reasons in the past, and I wonder if the mall considers unnecessary documentation to be threatening. Old North Durham neighborhood was a mixed bag of old and new and seemed like one of the areas undergoing a transition. We parked in the empty lot for the Grace Baptist Church which also housed the Durham Nativity School, a non-profit effort which serves to bring higher quality education to financially underprivileged boys in the area. In the backyard of this church was a shabby playground that looked to be falling apart. Surrounding this block, however, was a surprisingly eclectic array of large and fairly well established residences. Every house seemed to be painted a different color – from green to yellow to bright red. Each house also stood out because of its starkly contrasting architectural style from the rest of its neighbors. Interestingly, I did not notice very many vehicles at all in the driveways, and cars rarely passed through this area. There were a few pedestrians, and I watched one elderly lady board a DATA bus which had a stop right next to the Old North Durham Inn. Perhaps bus transportation is especially common in this area since it is so close to downtown Durham. 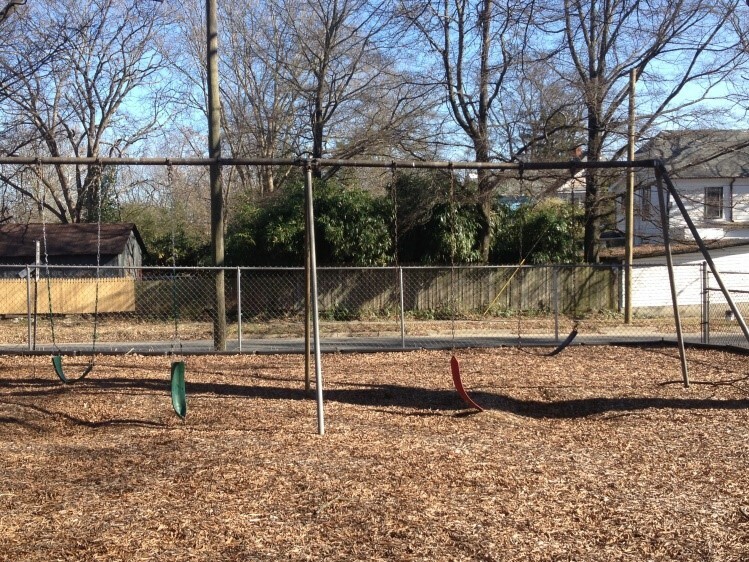 The juxtaposition of the old church and playground within a finer residential area suggests that this neighborhood is in a state of transition, but traces of poverty are still evident. Abandoned toys are strewn about on a grassless playground. One of the unique establishments around the Old North Durham neighborhood. East Main Street was by far the most rundown of all places I visited for this tour. The scenes along the entire route of North Alston Ave. departing from Old North Durham just seemed to become more and more entrenched in poverty the closer we got to East Main Street. At first, the houses just seemed old, then they had constructional damage, and finally entire units were boarded up and entire streets seemingly unoccupied. The neighborhoods around East Main St. are the ones that are currently undergoing some serious renovations. We passed by a house that is currently being rebuilt by Habitat for Humanity. If there are often houses here being rebuilt by Habitat for Humanity, then the renovation process for this area may be terribly slow and drawn out. It does not appear that there is any institutionalized reconstruction project in place, and some houses that are boarded up may have been empty for years. We stopped along a small street that branched off East Main to get a closer look at these boarded up houses. I was surprised to note that on one side of the street were strictly unoccupied houses while the other side of the street had cars and looked perfectly occupied. This atmosphere of this area was quite strange, and although it was broad daylight, I had the urge to get back in the car quickly. My friend was in the process of taking a photo of one of the occupied houses when the homeowner actually opened the door to see what we were doing. Although my friend successfully made small talk with the woman, I could tell that she was a bit suspicious of our activities, rightfully so. Many of the boarded up buildings had “Private Property” or “No Trespassing” signs bolted into the front, but I was surprised to see that the woman’s house also had one such sign right next to her “Life is Short, Eat Cookies” sign. Usually buildings have these signs when they are owned by someone or some entity that is not personally there to monitor the property. It just seemed odd that an occupied building would have one too. Most of the area around East Main Street is really empty which can certainly be attributed to the lack of suitable housing. The houses are small and bland and nothing about the housing structure stood out other than its poor state. There were often mixes of single unit buildings and town homes (3 units to a building) along a single street. Lawns were unkempt and strewn with tarps and other construction related trash. Other than residential spaces, we saw a learning center that offers vocational type training for those that perhaps struggle to achieve higher education. Adjacent to this learning center is a performance learning center for young students who are in danger of dropping out of school. A house that has every door and window boarded up. The household across the street sees this sight every time they exit their home. Another view of the same house. East Pettigrew Street showed us a bit of the manufacturing side of Durham. Two sets of railroad tracks run parallel alongside the street. 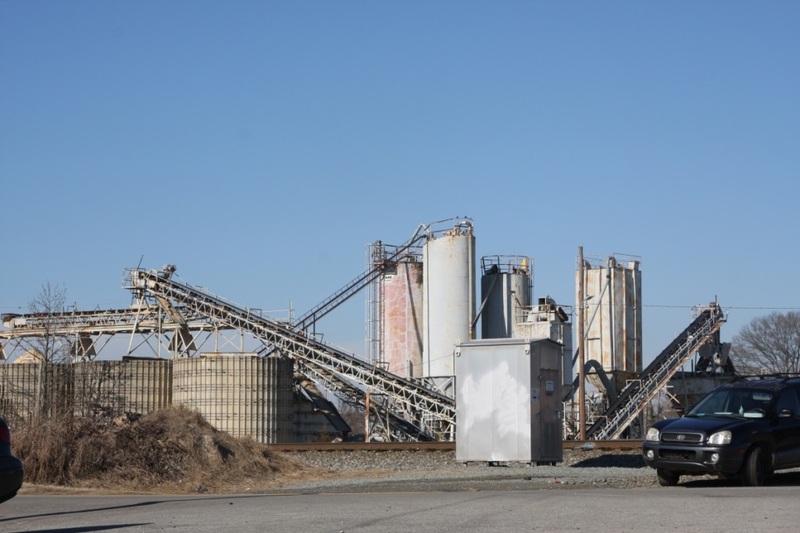 We passed by a number of large old manufacturing plants including Delta Gypsum and Holcim that looked to be producing cement. The area surrounding East Pettigrew is very expansive and underdeveloped, and this serves the ease of production and transportation well. Having these plants situated right next to the railroad also certainly aids the efficiency of the businesses. However, certain parts along the road suggest that manufacturing industries may be slowly phasing out of Durham, or at least in this area. There were junkyards with old trucks and cars, and some factory parts were rusting and falling apart, or all together abandoned. A gem we found on this tour is the Durham Green Flea Market which happened to be right on the side of East Pettigrew Street. Relative to its small area, the activity at this market was much more bustling than at Northgate Mall. Locals come to buy cheaper fresh produce, trinkets and even electronics from a predominantly Hispanic vendor base. A plant along East Pettigrew that is falling apart and probably no longer in use. Hayti is a small area that is more commercial than residential. A couple of large roads cut right through the district, and newer shopping plazas with small businesses and restaurants populate the space. The centerpiece of Hayti is the large and modernly architected Hayti Heritage Center, a locus of performance and gatherings for the historically African American community. Only a few cul-de-sacs surround the Heritage Center, and from what I saw, the majority of residents still seem to be African American. I stopped at an adjacent commercial plaza (one of the older plazas), but there was not a ton of variety in the shops. Four out of six shops were some form of barber shop or hair salon. The others were a flower shop and a Southern soul food restaurant. We opted to stop for a bite at the restaurant, and the chicken & waffles were every bit as good as Dame’s, but without the recognition, it happened to be much cheaper as well! Given the relatively modern look of Hayti, I would guess that Durham is trying to establish the area to become more commercially focused. East Forest Hills Boulevard along with Stoneybrook are by far the two wealthiest residential areas we visited on the tour. This neighborhood is essentially nested within the Forest Hills Park. As the name implies, the park has numerous shallow rolling hills, and many houses are built at the top or into the side of these hills. Also due to the geography of the land, houses are scattered and spaced very generously apart from one another. Like Stoneybrook, each building is strikingly unique – a large Georgian brick house is neighbored by a quaint German style house. Since East Forest Hills runs right along the edge of the park, houses look right upon the dense green landscape, and residents have easy access to the park’s trails. Kids (the only time we saw children outside on this tour) played soccer on the open fields while joggers and bikers traversed the trails. Although the housing density is low, we saw many more people outdoors than in any other area of Durham. This characteristic attests to the safety, recreational value, and affluence of the East Forest Hills neighborhood. 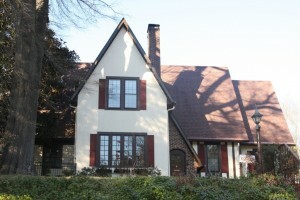 A cozy well maintained German style house in East Forest Hills Boulevard. It’s hard to see, but in front is a sign that alerts outsiders that the house is security alarm protected. North Carolina Central University is a compact urban campus distinguished by the blend of classic Georgian architecture and modern glass-heavy additions. The residential halls, which are not numerous, appear to have been recently renovated and look clean and comfortable. It is probable that the majority of students reside nearby the university or live in off campus housing. The landscaping was not remarkable given the time of year, but I could imagine that in the summer time, the campus would feel quite homely. We ventured into one of the science buildings, and both exterior and interior were similar to Duke’s own French Family Science Center. NCCU of course lacks the research and laboratory facilities that Duke possesses. 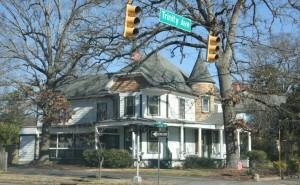 A busy street (Fayetteville Rd.) cuts right through a segment of the campus, and I wonder if this presents a dangerous crossing at night. The streets around NCCU actually seem really similar to the neighborhoods off Duke’s East Campus. 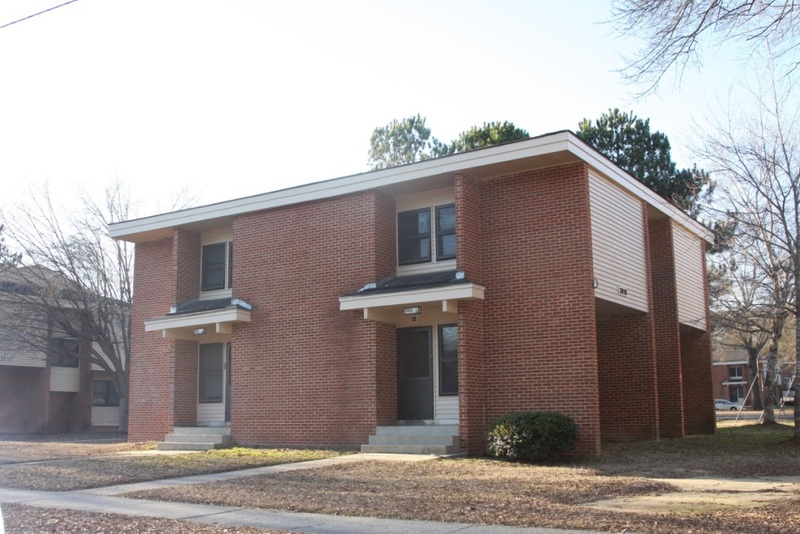 The small houses and apartment units are modest establishments and may serve as affordable off campus housing options for NCCU students. Weaver Street runs along the southern part of Durham isolated away from the denser quarters of downtown much like Cole Mill Rd. is in the northern part of the city. Most of the neighborhoods along East Weaver streets had large 1-story homes with spacious lawns set against a wooded terrain. The houses weren’t fancy, but were structurally sound, and lawns were clean. This space was also particularly empty as we did not see any people outside nor did we pass by any cars on this street (the only street where we could drive at 5 mph without guilt). Continuing on to West Weaver Street, we saw a completely different housing landscape. For about a third mile up until the end of Weaver Street, there were perhaps 30 identical plain town homes, each housing at least 2 units. The layout of this area as well as the institutionalized appearance of this complex suggests that it may involve publicly subsidized housing. I saw clothes hanging out on drying lines, so perhaps the housing units are so basic that they do not even include laundry utilities. The complex also had its own recreational center and seemed to function as an independent community. One of many identical town homes that populate West Weaver Street. The housing units are very simple, but appear clean and relatively new. 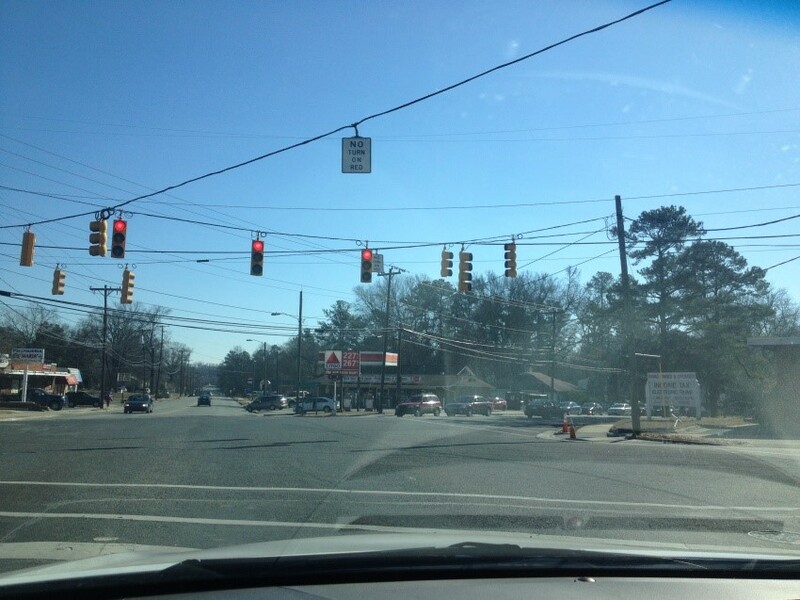 I started the tour of Durham at Cole Mill Road because I was the most familiar with this area. As I drove north along the road, I noticed several churches on the left side of the road that occupied a large amount of land. Smaller streets branched out from Cole Mill Road on both sides, but there were obvious differences between the two sides. The cul-de-sacs on the left side of the street seemed more closely packed together and more densely populated. These houses were visible from the street compared to houses on the right side, which included Stoneybrook Drive, Quailridge Road, E. Oak Drive, etc. There were many franchises along Cole Mill Road including Cracker Barrel and Cookout, which have thriving business. Adjacent to some less prosperous neighborhoods was the Stoneybrook Drive neighborhood. Upon entering, I immediately noticed a metallic “neighborhood watch” sign that signaled to me this is both a tight-knit and upper-middle class neighborhood. This is because in my own middle-class neighborhood in the suburbs of Los Angeles, a similar sign had been erected in response to a burglary two blocks away from me. According to Zillow.com, the value of properties in this neighborhood ranged from $300,000 to $1,000,000, which rival the real estate prices in Los Angeles1. Soon, I drove by a well-maintained golf course where several middle aged white residents were mingling next to their golf carts. Passing by the golf course, the houses began to come into view. The low population density of the area and wide streets provide excellent privacy to the residents. Most residents also benefited from the extra privacy given by the lush woods and gardens that surround their properties. 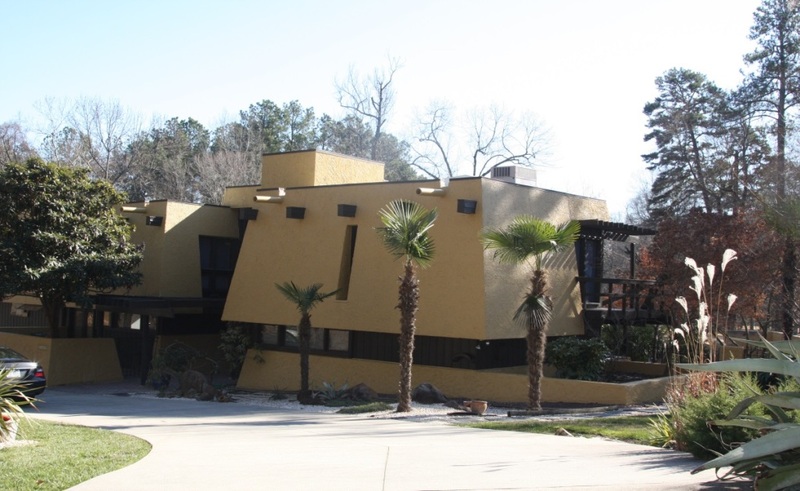 Every house on Stoneybrook Drive was uniquely designed, each had at least 2 stories, and many had architectural designs that were magazine- worthy. Some were stately estates while others were modern and boldly colored. Many houses had multiple luxury brand cars, with one house having two BMWs and another one having 2 SUVs. I feasted my eyes upon the diverse architecture and soaked in the safe, relaxing atmosphere of the neighborhood. At the end of the street was a privately owned lake that was clear and well-maintained. Guess road has always been known to me as one of the streets leading to the most confusing intersection in Durham. Many small local businesses dot the roadsides of Guess, such as a family owned tax filing company, a “Peluqueria” or barber shop, some small strip malls, and several local food favorites like Bojangles, Hong Kong Dimsum, and Hog Heaven. It is not very densely populated, and seems to be a commercial area that provides basic services and could be further developed. I have only been to Northgate Mall once since coming to Duke, so I was excited to explore the mall with an economic eye. As I drove into the lot, the difficulty of finding parking in this reasonably large space reflected that heavy flow of shoppers at this mall. Facing the parking lot, there was a more sprawled out version of the strip malls I’ve seen in the heavily immigrant suburbs in California. Strip malls usually gave lower to middle class immigrants a more accessible opportunity to start small businesses; it makes me wonder if there are many immigrants in the area. The layout of the mall seems less efficient than other malls I have seen, and the façade of the mall is less well maintained than higher-end malls like Southpoint. Most of the vehicles in the lot were relatively old sedans, which match the mall’s status as a “50 year old landmark of Durham.” At the entrance of the mall, there was a symbol saying that guns are forbidden, which implies that crime is a concern in the surrounding areas. On the inside of the mall, I noticed that some stores had “Se Habla Espanol” signs on their windows, implying a large Hispanic population. 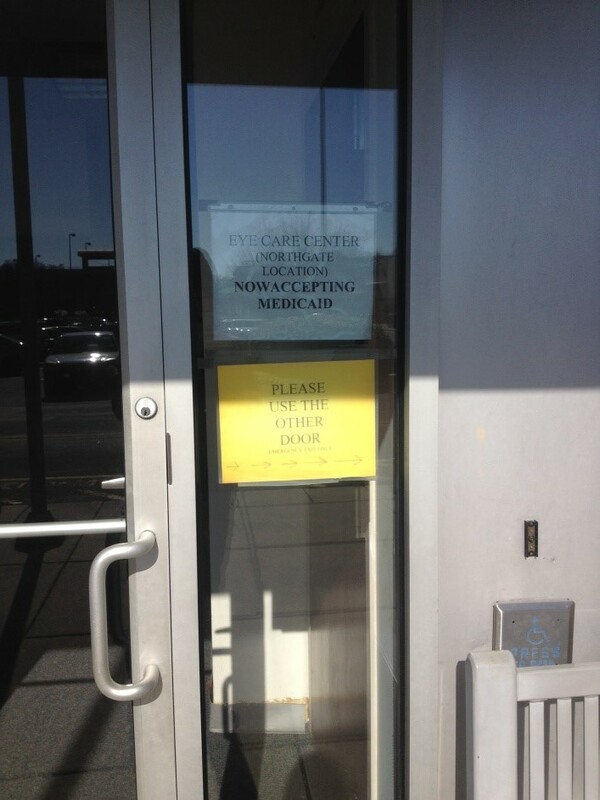 The eye center inside the mall also displayed a “Medicaid accepted” sign, which implies that the mall also caters to low income populations. A “Welcome to Old North Durham” stood out to me in this more humble-looking neighborhood. Most houses were mid-sized and adequately maintained, but obviously carry a lot of history given the material, color, and style of the house. Unlike the houses of the Stoneybrook Drive neighborhood, the houses of Old North Durham were not afforded much privacy from outsiders or from each other. Around the north blocks, houses were constructed closely together and directly faced the main roads. I did not observe vehicles around many of the homes. Across the street from the houses, I noticed there was DATA bus approaching a conveniently located stop, implying some dependence on public transportation in the area. At the nearby intersection of N. Mangum Street and Trinity Avenue was the Durham Nativity School, which is a middle school for boys from financially challenged families. 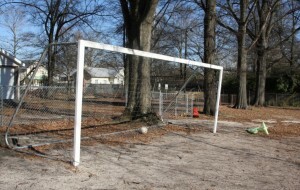 In the playgrounds in the neighborhood, I noticed that most of the equipments was derelict. One block south of the neighborhood, there were slightly larger, two story houses with decorations on the spacious porches. The variety of houses in this area and the proximity to school shows that this is probably a neighborhood with middle socioeconomic status and diverse levels of education. Leaving the north parts of Durham, I drove into the southeast part of Durham. There is a stark contrast in socioeconomic status between the neighborhoods around E. Main St (Guthrie Ave, Driver Road, Briggs Road, etc.) and the Old North Durham neighborhood. 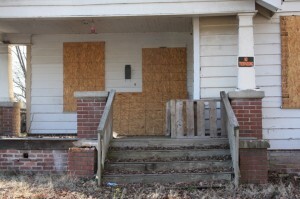 Some of the first houses I saw were boarded up, which implied they might be bank owned or in bad condition on the inside. 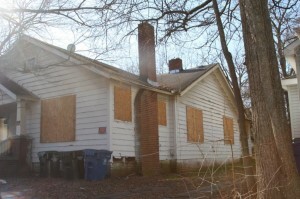 A vacant house which has been boarded up on E. Main St. I was familiar with several houses on Driver St. that were undergoing demolition or construction by Habitat for Humanity, which is a program that provides affordable housing to low income residents. On one of the times I worked inside a house with Habitat for Humanity, I learned that the house had sustained termite damage based on the holes that can be seen in the base of the floor. 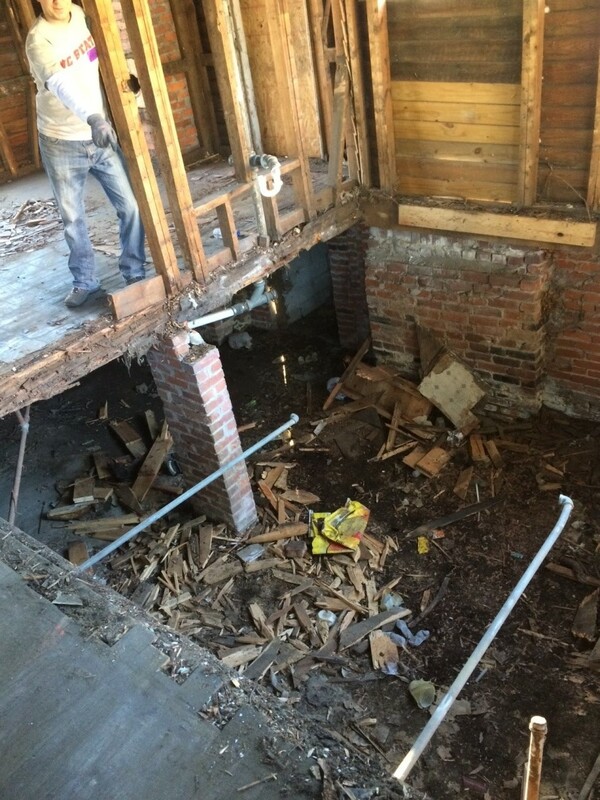 Several horizontal wooden boards joining the basement and the base of the first floor were bowing inwards due to water damage. Other houses are in relatively good condition and had been generously decorated with an eclectic collection of trinkets like a sign that says “Life’s Short, Eat Cookies!” This was the first neighborhood in which I saw children playing outside; one was African American and the other was Hispanic. The Holton Career and Resource Center was also located nearby, which I know provides vocational training to the unemployed and enrichment classes for children who attend designated schools in low-income areas. This was one of more run-down neighborhoods I have seen in Durham, and the population seems to be mostly low-income with little socioeconomic heterogeneity. I drove over multiple train tracks to turn onto E. Pettigrew St., which ran parallel to the train tracks as well as Highway 147. The region that Pettigrew St. span seemed very poorly economically developed and bleak compared to Guess Road or E. Main St. Some of the spots I passed by included the Boys and Girls Club, electricity generators, and a cement and concrete company called Holcim Trading Inc. There were not many businesses and stores other than the Durham Flea Market, which may have only gathered because it was the weekend. Along the road, I mostly saw African American or Hispanic residents who were gathering for the Durham Flea Market. I drove into the Hayti area on Fayetteville St., turned left onto Lakewood Avenue, and then turned right onto old Fayetteville St. The area seemed to be very close to Highway 147, which may discourage residents who value quietness. On the corner of Lakewood Avenue and Old Fayetteville stood the Hayti Heritage Center housed in a beautiful red church, reflecting the strong African American heritage of the neighborhood. I noticed a limousine rental company, International Food Market, and an abundance of soul food around the block. Coincidentally, I bought a delicious chicken and waffles entrée from the soul food diner Bowick’s Arc for lunch. 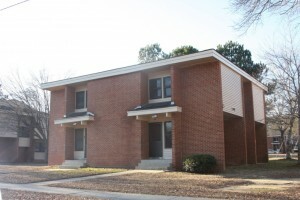 On Hayti Lane, a small cul-de-sac on Old Fayetteville St., I saw the first multi-family condominiums around Durham, each having 3 connected two-story units. 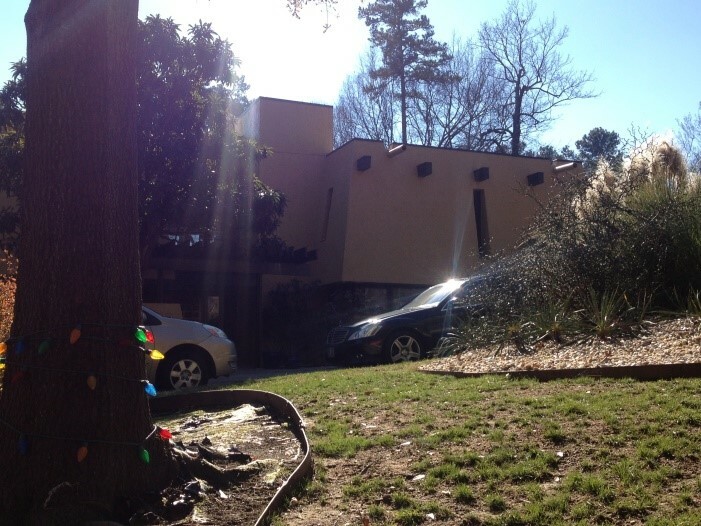 The driveways and lawns were very well-maintained and picturesque, and the residences were more spaced out than the Old North Durham neighborhood. Most houses had recent makes of vehicles, which matched the nicely renovated condos. The neighborhood had a majority of African American residents, some of whom were playing basketball outside of the condos. The area appears to be inhabited by educated, middle class families. I returned closer to Duke University from the Hayti area and reached E. Forest Hills Blvd. One of the first things that came to mind when I saw the E. Forest Hills neighborhood was the cabin resort area in the Blue Ridge Mountains where I had spent fall break. Even the name “Forest Hills” elicited the image of an ideal suburbia. It was very similar to the Stoneybrook Drive neighborhood, but the houses had more diversity in size. Houses were beautifully maintained and were situated at higher elevations and the only visible part of most houses from driving down the street was the extended driveway outside many houses. 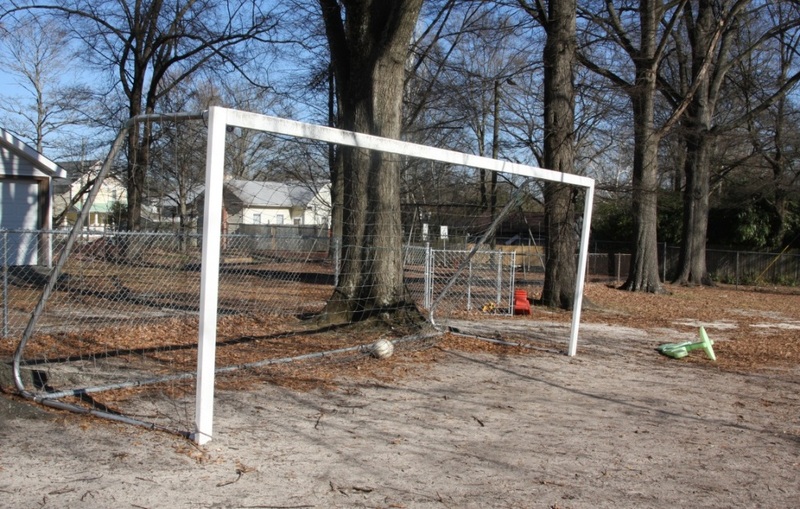 I drove by many signs that read “Parks this way, play more,” and observed 2 white teenage girls playing soccer in one of the many grassy park areas. At the intersection with Enterprise St, many joggers were biking and running freely along the well-designed trails in the neighborhood. Although a majority of the inhabitants were white, I also saw 3 African American children leaving one house to play. I venture to guess that this area is inhabited by the highly educated upper-class in Durham. Most of the buildings on the NC Central University campus were built in the beautiful Georgian style, except for the residential and science building that bore modern reflective glass on the outside. The buildings are very well-renovated and give off a calming vibe. 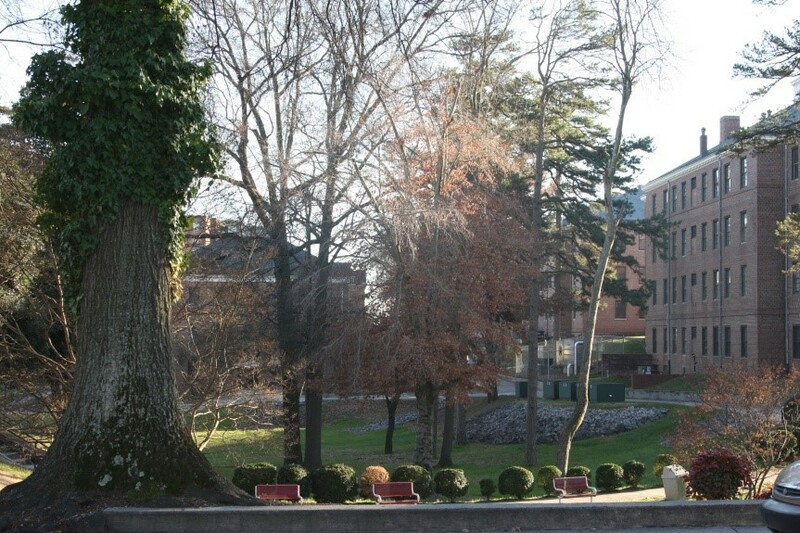 The campus is very connected with the surrounding residential areas, seemingly bordering the Hayti area. Inside the science building, there was an array of brochures for programs in health sciences and earth sciences targeted at minority populations, which makes me conclude that the college consists of a large minority population. As we walked past the residential buildings, we saw only African American students exiting the buildings and walking around campus. The surrounding residences consist of efficiently designed one or two story houses and are probably rented by students. The businesses surrounding this area are typical of that of a college town, including several commercial banks, restaurants, and bookstores. On Weaver St., there were several neighborhoods consisting of very uniform housing that reminded me of public housing projects I had seen in Compton. The houses were humbly built with one door and a few windows, and housing units were spaced out very evenly in a grid pattern. Most households did not own vehicles and did not have much lawn space. 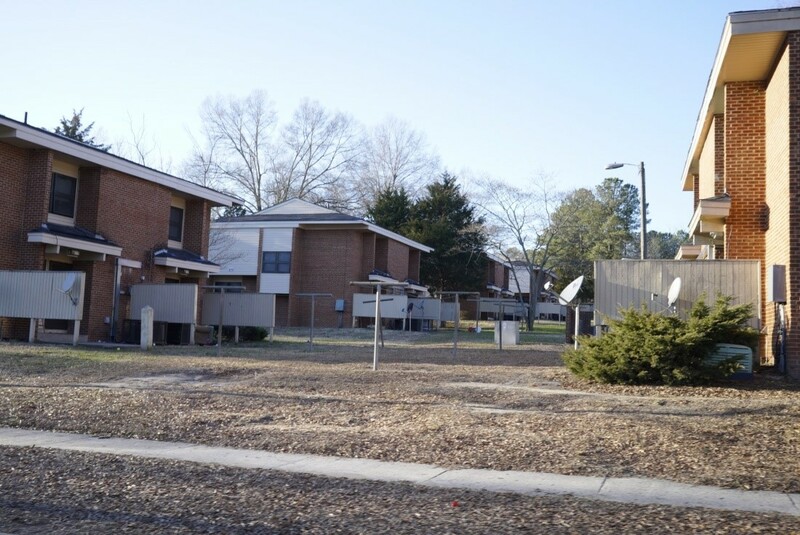 To me, public housing projects usually represent an effort to revitalize the areas where the population had undergone displacement or housing crises. This region has probably undergone economic hardships in the past years, but has been recovering from it. Overall, I did not notice much business activity around the neighborhood. Public housing units on Weaver St.
Prabhanjan Didwania on The association between urban sprawl and obesity: is it a two-way street? Urban Economics is powered by WordPress at Duke WordPress Sites. Please read the Duke Wordpress Policies. Contact the Duke WordPress team.